A Conversation With Gregg Deal On Being "The Last American Indian On Earth"
Though Indigenous Americans make up less than 2 percent of the population, the space occupied by Natives in the national imagination is at once far larger yet infinitely more reductive and outdated than the reality thanks to the mythos perpetuated by pop culture and public education. Because of this, what the other 98 percent know of Natives is almost never informed by the stories, struggles and triumphs of Indigenous people living today. However, there is a significant movement to reclaim this narrative. And for people like Gregg Deal of the Pyramid Lake Paiute nation, it's happening one incisive, brutally funny performance art project at a time. 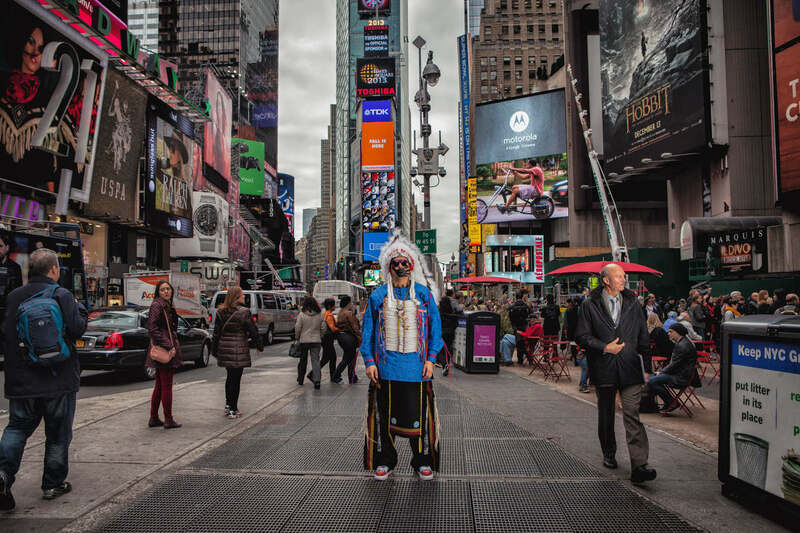 In his documentary short, "The Last American Indian on Earth," the 6'4" Deal roams the streets of major American cities like New York and Washington D.C. dressed as a caricature of a plains Indian - that iconic image most obsessed over and appropriated around the time of Halloween or Coachella by people across the country. By doing so, he exposes the prejudices, misconceptions, stereotypes and fascinations held by non-Native people when they suddenly find themselves in the presence of a Native person who is dressed to meet their expectations. "It looks really bad from the outside," Deal says of his choice of outfit for the film. "Store bought headdress, made in China. Yeah, it's bad, but it's not my bad, it's Western consumption's bad...Honestly, for Indigenous people who know what they're looking at, it should look horrible. The fact that average Americans had no idea that it's horrible is the point." In fact, those average Americans shown in the film often reveal themselves as so ignorant as to be utterly clueless. "Are you pure Indian?" one woman asks after a series of questions regarding the color and straightness of Deal's hair. "Are there any 100 percent Indians left?" she goes on to inquire. It's a bizarre encounter, as though she can't believe that any "real" Natives exist and that the one standing before her is a sort of sideshow oddity who must prove that his existence is more than smoke and mirrors. The woman's interrogations were hardly the worst of what Deal experienced, much of which took place when cameras weren't rolling. "The biggest thing I wish I could have illustrated though film was the microaggression, the people who would see me and loudly do a 'war cry,' people raising their hand and saying 'how' or the van filled with a family that rolled down their windows and slapped their hands over their mouths using that other 'Indian' sound we know and love," Deal said. "These things happened all the time. While I'm sure some may roll their eyes at this and think it's an exaggeration, the film is a small part of a huge and very real issue of dehumanizing Indigenous people, and the lack of compassion for our lives and existence." What could justifiably be a film about sadness or untempered anger in the face of this type of racism Deal transforms into a work of wit and grace at every turn. At times, he laughs with his audience even as he provokes them to examine their beliefs. Other times, he embraces them when they're awed by meeting a Native in the flesh. Still other times, Deal simply stands before national landmarks holding signs with phrases like "White guilt is my spirit animal," waiting for someone to get the joke. From the beginning, Deal knew that for the film to ever have the impact it was meant to, it had to paint a bigger picture about what it means to be a Native person alive today. "It's unique for an Indigenous person to tell their own stories from their perspectives," he said. "It's not just about the story, but it's about the way that Indigenous people are often waiting for value to be placed on their story, which oftentimes has a Western context to it. It's that Kevin Costner, Johnny Depp, Daniel Day-Lewis, Adam Sandler bridge that is meant to add value to Indigenous stories so the rest of the world cares. I wanted to do this film to tell it from my perspective and show the many issues therein. So it went from just documenting to being on a quest to tell an Indigenous story in real time. I'm not saying my (individual) voice or story is important - that can be debated - but Indigenous people telling their stories with ownership of them is vastly important." The story told in "The Last American Indian on Earth" is at once entertaining and disheartening. At its poignant climax, we learn that even this story - a labor of love conceived and performed by Deal - would be appropriated and exploited for personal gain by the non-Native man he had trusted as a friend and colleague on the project. While Deal cannot speak directly on the matter for legal reasons, he remains undaunted by the experience and sees the documentary as well as future projects as part of an ongoing movement toward social and political justice. "I personally believe that Indigenous people are rising up," he said. "We're often applauded for our resilience, but resilience is survival. There is a tipping point where survival becomes thriving. That is where we are...Our stories don't just matter, they're the foundation this country is built upon. It must be realized that we aren't just here, but that you are walking on the very ground of our forefathers. There is a need to reconcile these things, to reconcile the history, to push for value without Western input, and to help the current inhabitants of this country honor this space and the people who have been here since the beginning. This film is part of that effort. It's educating people on a point of view that is not often allowed in popular media. These things matter, despite the many non-Natives that are so willing and ready to speak for us." Despite the many negative experiences he's had with his audience, Deal embraces these as part of the process and welcomes those who reach out in ignorance, interest or some combination of both. "I'm a huge fan within my work to just let it be in the space it occupies and allow people to bring to the table whatever they want," he said. "Their misunderstandings, their education, their prejudices, whatever, it's what makes it beautiful and horrifying and hilarious and amazing."